Hamid Karzai addresses a press conference at the Presidential Palace on November 3. Kabul, Afghanistan (CNN) -- Making his first public appearance Tuesday since being declared the winner in a disputed election, Afghanistan's President Hamid Karzai vowed to stamp out corruption and work with the Taliban in his third term in office. "Afghanistan is accused with mass corruption. 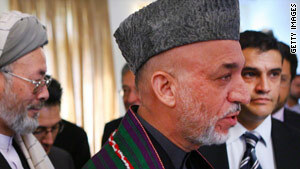 I will try to clean it up," Karzai said. After three decades of war, Afghanistan faces challenges, he said. "It is stepping forward towards a more institutional legal order while still struggling against terrorism and the menaces that affect us all. We are aware of difficulties of our governance and the environment in which we live. We'll keep trying to do our best to address the questions ... facing Afghanistan," he said. In addressing the nation's insecurity, Karzai said he would engage the Taliban. "The call for peace, the call for security of Afghanistan is one of the main desires of the Afghan people," Karzai said. "I would also call to the Taliban to ... join the government ... with respect to the Afghan constitution." But a Taliban spokesman said claimed success in helping disrupt the election, which he called a "fraud." Zabiullah Mujahid said: "The fraud election was in Washington, not in Afghanistan. The people of Afghanistan did not vote to select their president. All the people understand that it was a fraud election. "We got successes in our struggle against the election. The government was not able to run the election and they announced the president." Karzai admitted that a runoff would have been better for the country, but he said his mission now will be to form an all-inclusive government with even those who opposed him. "I hope all Afghans to be part of the government and the Afghan system," he said in an attempt to unify the nation after a divisive election. Afghans went to the polls on August 20, in a vote marred by widespread fraud. Karzai had initially claimed victory, but two months after the vote, a U.N.-backed panel of election monitors threw out nearly a third of his votes, citing fraud. That left Karzai short of a majority, and he eventually agreed to a runoff. But Karzai was declared the winner Monday after his chief challenger Abdullah Abdullah dropped out of the runoff that would have taken place Saturday. Abdullah had called for the resignations of top election officials and politicians to avert electoral fraud in the runoff. He argued that the commissioners, who were hired by Karzai, cannot be impartial. But that request was not met, Abdullah said Sunday, and he did not believe a transparent election was possible. A runoff could have been held with just one candidate, but commission president Azizullah Lodin said electoral officials decided to cancel the second round of voting for several reasons, including security and money. Some observers say that in his third term, Karzai's real test will be whether he can form a government that is viewed as legitimate in the international community, and more, importantly, at home. U.S. President Barack Obama called Monday for a "new chapter" of improved governance in Afghanistan now that Karzai's re-election as president is complete. "Although the process was messy, I'm pleased to say that the final outcome was determined in accordance with Afghan law, which I think is very important," Obama said.